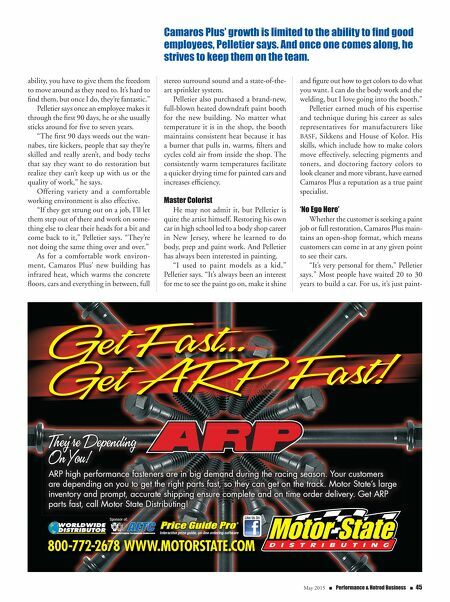 44 n Performance & Hotrod Business n May 2015 HOTROD recognized by the Speed Channel, which broadcasted a segment about the vehicle and how it was restored to a much higher level than its original factory condition. "It was the nicest Boss at the show, which was kudos to us," Pelletier says. Additionally, a '67 Mustang Clone GT500 convertible completed by Pelletier and his team was recently highlighted in Mecum Auctions' monthly magazine as an example of what an over-the-top resto- mod should look like. Another notable project is a restoration of a triple-black '69 ZL1 Clone, which fea- tured all-black interior and exterior. One of 69 vehicles of its kind in the world, the ZL1 Clone's paint was special-ordered from Europe. "It's the deepest, blackest black you can buy in the world," says Pelletier. The restoration took home first place in its class at Greybeard's Custom Car and Bike Show, a car show in Denver. One of Pelletier's favorite projects is a '69 El Camino that a customer wanted chopped. 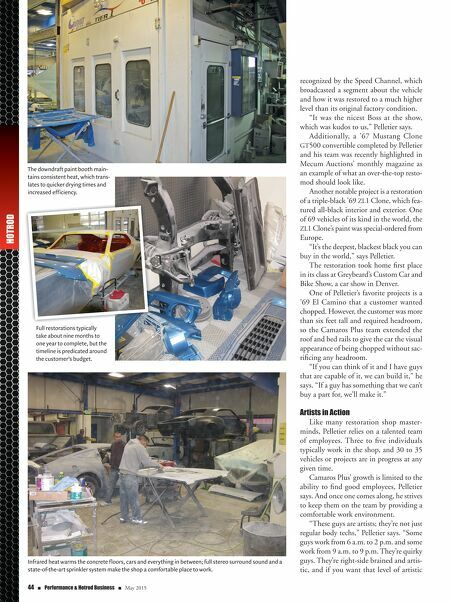 However, the customer was more than six feet tall and required headroom, so the Camaros Plus team extended the roof and bed rails to give the car the visual appearance of being chopped without sac- rificing any headroom. "If you can think of it and I have guys that are capable of it, we can build it," he says. "If a guy has something that we can't buy a part for, we'll make it." Artists in Action Like many restoration shop master- minds, Pelletier relies on a talented team of employees. Three to five individuals typically work in the shop, and 30 to 35 vehicles or projects are in progress at any given time. Camaros Plus' growth is limited to the ability to find good employees, Pelletier says. And once one comes along, he strives to keep them on the team by providing a comfortable work environment. "These guys are artists; they're not just regular body techs," Pelletier says. "Some guys work from 6 a.m. to 2 p.m. and some work from 9 a.m. to 9 p.m. They're quirky guys. They're right-side brained and artis- tic, and if you want that level of artistic The downdraft paint booth main- tains consistent heat, which trans- lates to quicker drying times and increased efficiency. Infrared heat warms the concrete floors, cars and everything in between; full stereo surround sound and a state-of-the-art sprinkler system make the shop a comfortable place to work. Full restorations typically take about nine months to one year to complete, but the timeline is predicated around the customer's budget.